Chutney is one of the very important staples at Scrumptious Street and recently we (gasp!) ran out. It's much more than a condiment in our home; it's truly a necessity. We use it with vegetables, bread, eggs, meat or in some cases fruit (bananas! yes, try it). I cook with it, bake with it and use it in dressings and marinades. A real crisis hit when we realized we had finished the last bottle of our favorite brand, and can't seem to find it in our local California markets. We knew exactly who carried it in NY, now I'm baffled why I haven't found it yet so will resort to online ordering. I had planned to make a chicken dish for a recent dinner party and realized with some thought and effort, I could approximate one of our favorite chicken dishes baked with chutney in the marinade by simply composing a sauce using some of the flavors in chutney. One key ingredient of which is apricot. Stone fruits, onions, vinegars, oil and spices are the main layers in many chutneys. My homemade version turned out great and even surprised our self-professed foodie friend and guest. Here's a look at my "Chicken with Apricot-Spiced Sauce à la Chutney". Once the idea occurred, it was fun and simple to make using sweet-tart-onion-herbs-spice combinations. The longer you can let this one marinate before baking, the better. It's also incredible the day after with leftovers in a sandwich, as part of soup or any way you like these flavors. Your imagination can really shine with this one. I chose to use Garam Masala as my main spice, it's an amazing blend of various spices. You could substitute the component spices here such as cumin, cardamom, nutmeg, ginger, etc. I wanted simplicity and bang for the buck. It's your choice, but the garam masala worked spectacularly! Also, I used bone-in, skin-on chicken for the intense flavor and the fat it yields while baking to make such a gorgeous stock. I then use that to finish off the sauce for serving. It's about getting the best flavor into the dish. Once cooked, you can easily remove and discard the skin, which nearly everyone prefers. 1. Season the chicken with olive oil, kosher salt and pepper and set aside. Make the sauce using the garlic, mayonnaise, apricot preserves, vinegar, tarragon, salt, pepper, garam masala and chicken stock. Whisk together in a bowl until smooth and incorporated. Pour 1/2 cup of the sauce into a separate small bowl to reserve. 2. Place the chicken into a very large plastic ziploc bag and pour the sauce over it. Zip tightly and marinate in the refrigerator for a minimum 2-3 hours and up to 6 hours, shaking the bag at least once an hour to coat all pieces. 3. When chicken is done marinating, preheat oven to 375˚F. Put the chicken pieces and the marinade in a large baking dish with lid. 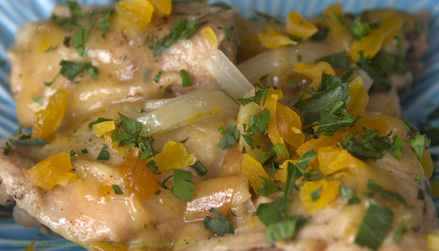 Scatter the slices of onion and apple amongst the chicken thighs. Cover the dish and place in the oven, baking for 45 minutes to 1 hour, until chicken is tender and juices run clear. 4. When the chicken is done, pull out of the oven and remove the chicken, cover with foil and keep warm. Strain the baking stock into a bowl and skim off the extra fat. In a saucepan, add the butter and flour and make a roux by melting and cooking them together. Add the reserved 1/2 c. marinade and whisk thoroughly. Bring the sauce to a boil. Slowly drizzle in the baking stock until the sauce is thick but able to be poured. Remove from heat. 5. Plate the chicken and pour the sauce over the dish, garnish with chopped parsley and apricots and serve immediately. Hope you like this one! Trust me, it's so much tastier than it looks! Katie, indeed it is -- a wonderful dish to bring in bright spring-time flavors when you still don't have wonderful fresh fruit! The Garam Masala also makes it warm and inviting...hope you give it a try.